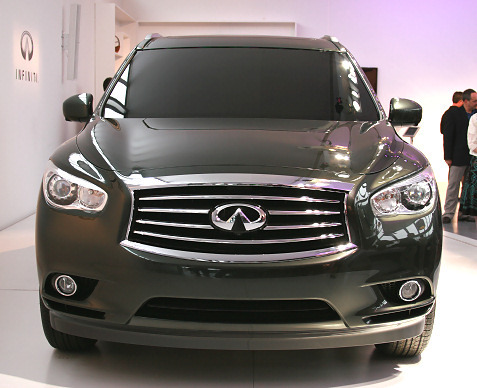 Infiniti invited Bullz-Eye out to Pebble Beach for the annual Concours d’Elegance and the introduction of the new Infiniti JX Concept crossover. The new vehicle was unveiled last night at an elegant reception at the famed Lodge at Pebble Beach. As you can see from the photos above, the JX Concept stands out with aggressive styling. The accessibility and comfort of the third-row seating will also be a major selling point. “With the JX, you will even be able to leave a child seat latched to the 2nd row while getting in or out of the 3rd row – just one example of the vehicle’s inspired flexibility and versatility,” explained Infiniti Americas Vice President Ben Poore. “The 3rd row isn’t the typical penalty box either, with adult-sized room for all occupants and five-and-a-half inches of 2nd row forward-back adjustability.” Learn more about this and other Infiniti vehicles at the Infiniti Facebook page. Check back as we will be posting more updates from the Pebble Beach Concours d’Elegance. This event is one of the premier celebrations of the automobile as only the most beautiful and rare automobiles are invited to appear on the famed eighteenth fairway of Pebble Beach Golf Links each year.